Need a quick argument for or against the existence of God? There are now apps to consult, both for believers and non-believers. There's "the pocket atheist," written by the son of a fundamentalist preacher. Then there are believer apps. 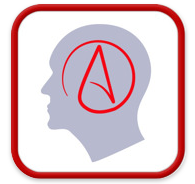 One app, “Fast Facts, Challenges & Tactics” by LifeWay Christian Resources, suggests that in “reasoning with an unbeliever” it is sometimes effective to invoke the “anthropic principle,” which posits, more or less, that the world as we know it is mathematically too improbable to be an accident. Wha...? Without even pulling out an iphone, I can think of numerous contradictions. Big ones, too. Please, someone explain this to me: how do believers not know about this contradiction, despite the years they spend going to Sunday school and participating in bible groups? There are lots of contradictions in the bible, and there'd be even more if different decisions had been made about what to include in the canon. You see, real people decided what was in and what was out, and one basis for deciding was to increase continuity and reduce contradictions. But you see, to err is human. So there are still contradictions. Okay, so I'm no fundamentalist/literalist and I think there are contradictions in scripture, but the verses you contrast don't seem contradictory to me. "After much thought and consultation, John built his house and his garage." "John wanted a place to live so he built a house. But once the house was built, he realized there was no place for his car. So looking at the architectural details of the house, he built a garage with much of the same basic design as the house." Seems to me that if the verses you quote are contradictory, then these stories are too. But they aren't, so neither are the verses. I don't really follow that. Gen 1 says God created both males and females on day 6. So what's Adam doing alone in Gen 2? Why does God have to make a companion for him? First let me compliment you on the title for your article, it is brillant. I do agree with Tom that the verses you have chosen to illustrate do not show a contradiction. May I first offer Genesis 1:27 with a New English Translation from the Hebrew Text? It reads : And God created the human in His image, He created it in the image of God; He created them male and female." God was creating the human race. The word in Hebrew for human is Adam, the word "man" is not used until after the formation of woman (2:23), which implies that a sexual identification is meaningless so long as there is only on being. What is the meaning of a sexual distinction when there is only one of something?! "And the human said, This time it it: bone from my bones and flesh from my flesh. This will be called 'woman' for this one was taken from 'man'." Now after woman has been formed, the word "man" occurs for the first time instead of "human". Sexual distinction has no meaning unless there are two or more kinds of a species, so there is no male until there is a female. They sure seem contradictory to me, and the general explanation of Biblical criticism is that Genesis 2 is an earlier and more primitive version. In any case, the quote above claims that the Bible contains no contradictions and a unified story line. Now, is anyone willing to affirm that the Bible contains no contradictions? If so, let's bet, say, a thousand dollars. I'll bet that in a few hours I'll find at least one contradiction in the Bible. Spinoza, in the 17th century, filled his Theological-Political Treatise with Biblical contradictions, and I doubt that the Bible has eliminated those contradictions since then. So, if anyone wants to bet their Bible knowledge against my friend Baruch Spinoza, there's a thousand dollars on the table. Now, a unified story line? A readable plot? The Book of Numbers makes great reading; Leviticus is pure fun; Deuteronomy is the life of the party. I'm not saying there is no conflict or even contradiction between the two Genesis creation stories. What I am saying is that the passes you quote don't seem to be to be inconsistent. 1:27 seems to be to assert two things: God created humans and humans are made in God's image. 2:22-23 asserts many more things but nothing that I can see that contradicts the two claims in 1:27. Do you read it as denying either that God created humans or that humans are made in God's image? I've not dug out my Bible to read the context and so maybe I'm missing something but I still don't see any contradiction. Er...I mean't "the passAGES you quote"--of course. On the two Genesis creation narratives. "Contradiction" is a technical philosophical terms, and sometimes we non-philosophers forget that. Darren- Your explanation still doesn't resolve the contradiction. If he created male and female, then there would have to be both. The human race is both, but there is only a singular example of the human race at the time of creation, Adam. So if he is the totality of the human race, then he only created one thing, male. THEN he brought into creation female AFTER he had created male. So unless Genesis 1 was referring to the time AFTER Genesis 2, Genesis 1 is contradicted by Genesis 2. This pretty much goes for everyone else's attempt at reconciliation of the contradictions. So again the contradiction. Gen 1 says God created men and women, on the 6th day. Gen 2 says he only created a man. the man was lonely, so he created a woman, eve. Unless the story of Eden takes place on the 6th day of creation, there is a manifest contradiction, since there are no other human beings on earth, except Adam in the story of Eden. Tom, what I'm saying is God creates male and female in Gen 1, and (just after that says go forth and multiply, which implies there are two sexes in the picture). In Gen 2 it looks as though Adam is all alone at first, and God has to create a female to keep him company. So, before Eve, there are females (based on Gen 1), and there aren't (based on Gen 2). Darren, In Gen 1 it says male and female he created them (them! ), and right after that it says "God blessed them [again, plural] and told them to be fruitful and multiply." The "be fruitful and multiply" is all the more reason to take "them" and "male and female" at face value. It takes two sexes to multiply. Hm. I'm not sure I know how to make the consistency more plain than I have. Based solely on the originally quoted verses, Gen 1 only asserts that God created men and women, and that men and women are created in God's image. It says nothing about order, it says nothing about simultaneous creation, and it says nothing about method. Gen 2 tells us that man was created first, that he wasn't particularly happy, so God created a woman from man's rib, and that Adam came up with the name for the female of the species. There's nothing in any of that that denies either that God created men and women or that God created men and women in God's image. Again, I've not looked at the relevant chapters in a while. And I do think there are inconsistencies there. But I'm not seeing them embedded in these verses. Ah, I think I finally get it: you're assuming that Gen 2 describes events that occur after the events in Gen 1. Is that it? If so I now (finally!) see the problem: you've already got both man and woman in Gen 1 and Gen 2 assumes that only Adam exists until the whole rib thing happens. I've been taking Gen 2 to offer a distinct creation story from that offered in Gen 1. Yes! Isn't that the way Genesis is normally read? First God created the world (including male and female). Then, later on, stuff happened in the garden of Eden, etc. The fancy scholars say "two different creation stories" but an editor put them together in a sequence so it looks like "first this, then that." But taken as one single narrative, it's contradictory. That's what the app guy denies--he says even though the bible was written and edited by lots of people, it all fits together without contradiction. Which is supposed to be proof of the existence of God. OK, so if you don't much like this example of contradiction, what would be a better one? Another contradiction? The order of creation is different in the two creation narratives; in the first (Genesis 1) plants and animals are created before man; in the second (Genesis 2), man is created first.